Producing linguistic summaries of large databases or temporal sequences of measurements is an endeavor that is receiving increased attention. These summaries can be used in a continuous monitoring situation, like eldercare, where it is important to ascertain if the current summaries represent an abnormal condition. Primarily a human, such as a care giver in the eldercare example, is the recipient of the set of summaries describing a time range, for example, last night’s activities. However, as the number of sensors and monitored conditions grow, sorting through a fairly large number of summaries can be a burden for the person, i.e., the summaries stop being information and become yet one more pile of data. It is therefore necessary to automatically process sets of summaries to condense the data into more manageable chunks. The first step towards automatically comparing sets of digests is to determine similarity. For fuzzy protoform based summaries, we developed a natural similarity and proved that the associated dissimilarity is a metric over the space of protoforms. Utilizing that distance measure, we defined and examined several fuzzy set methods to compute dissimilarity between sets of summaries, and most recently utilized these measures to define prototypical behavior over a large number of normal time periods. In this talk, I will cover the definition of fuzzy protoforms, define our (dis)similarity, outline the proof that it is a metric, discuss the fuzzy aggregation methods for sets of summaries, and show how prototypes are formed and can used to detect abnormal nights. The talk will be loaded with actual examples from our eldercare research. There is much work to be done and hopefully, more questions than answers will result from the discussion. 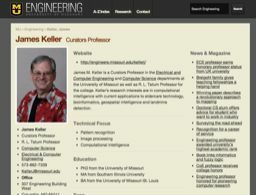 James M. Keller is a Curators Professor in the Electrical and Computer Engineering and Computer Science departments at the University of Missouri as well as R. L. Tatum Professor for the college. Keller’s research interests are in computational intelligence with current applications to eldercare technology, bioinformatics, geospatial intelligence and landmine detection.